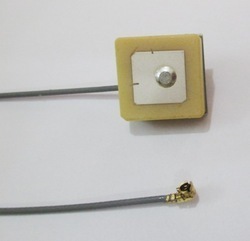 We manufacture magnet mount antenna for GPS modules operating at 3V and 5V. Designed for use with automobiles the magnet will hold the antenna in place at speeds greater than 200Km/hr and rough terrain. The magnatic mount GPS antenna is avilable with option of 3 meter and 5 meter cable terminated with standard male SMA connector. 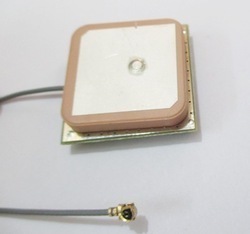 We provide a leading range of active GPS patch antennas to connect directly to your GPS module. They connect directly to the module connector or to an on board connector fed to the module. Our antennas incorporate smart LNA design in order to filter out noise and deliver "pure" signal down to your module. Active antenna products simplify design and deliver the extra sensitivity required for in vehicle or mobile devices. These are the antennas of choice for smartphones, navigation devices, tracking devices, consumer GPS devices and many handheld devices incorporating GPS for location based services. The antennas are available with a variety of connectors to suit your module or we recommend U.FL compatible connectors as a standard. 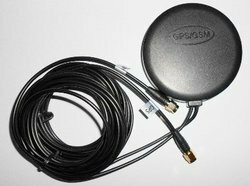 This high performance, low-profile GPS/ GSM antenna is one of our latest versions of a dual purpose mobile antenna. This model is commonly used for OEM, system integrator and end user applications. The combination of a high gain GPS antenna and -1 dBi GSM band antenna is ideal for those applications that require durability, small size, covert installation and rugged construction. The antenna offers a 27 dB gain (active patch). It features a "bottom exit" coaxial cable configuration with a standard SMA connector. This antenna performs well in foliage, urban and noisy environments. It is specifically designed for fixed location, permanent mount applications. These antennas are waterproof and comply with automotive temperature and vibration standards. It comes standard with a 5 meter cable or 3 meter cable, operates on 3-5VDC and has SMA connectors. Looking for GPS Antenna ?